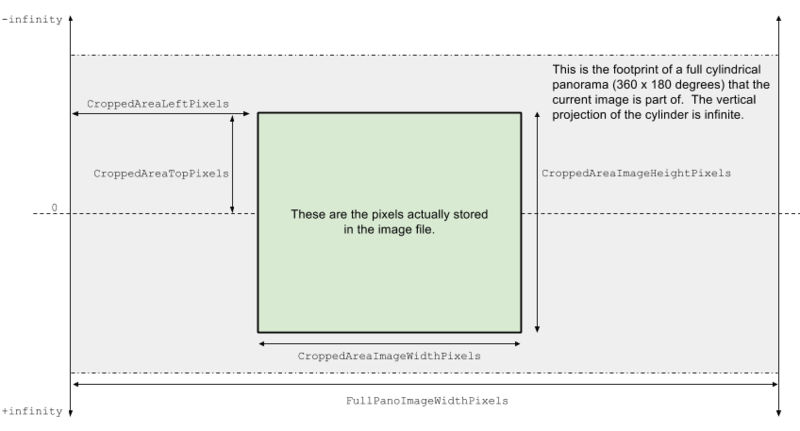 The panorama namespace described here contains properties that provide information regarding the creation and rendering of photo spheres, also sometimes referred to as panoramas, such as those created by the Photo Sphere feature in the Android 4.2 camera. The metadata should be serialized and embedded inside the photo sphere as described by the Adobe XMP standard (see references at the end of this page). The diagrams and table below show the photo sphere properties encapsulated by the GPano Parameters. When editing and viewing photo spheres, please be sure to verify and update the metadata accordingly as described later in this document. When specifying the pose and initial heading fields, please be sure to follow the Euler angle conventions discussed later in this document. Note that Google products support spherical projections only. Additional projections are currently supported only by other parties. Note that if the top of a cylindrical image is above the horizon, CroppedAreaTopPixels must be negative. A value of 0 for CroppedAreaTopPixels will place the top of the image at the horizon. A positive value of CroppedAreaTopPixels places the top of the image below the horizon. No change. An application may decide to switch this to False if the field of view falls below a certain value. equirectangular Projection type used in the image file. Google products currently support the value equirectangular only. scale/crop: No change. GPano:PoseHeadingDegrees Real No, but is required for display on Google Maps n/a Compass heading, measured in degrees clockwise from North, for the center the image. Value must be >= 0 and < 360. scale/crop: No change. GPano:PosePitchDegrees Real No 0 Pitch, measured in degrees above the horizon, for the center in the image. Value must be >= -90 and <= 90. scale/crop: No change. GPano:PoseRollDegrees Real No 0 Roll, measured in degrees, of the image where level with the horizon is 0. As roll increases, the horizon rotates counterclockwise in the image. Value must be > -180 and <= 180. scale/crop: No change. GPano:InitialViewHeadingDegrees Integer No 0 The heading angle of the initial view in degrees clockwise from real world North, not relative to the pano center. scale/crop: No change. GPano:InitialViewPitchDegrees Integer No 0 The pitch angle of the initial view in degrees above the real world horizon, not relative to the pano center. scale/crop: No change. GPano:InitialViewRollDegrees Integer No 0 The roll angle of the initial view in degrees where level with the real world horizon is 0. As roll increases, the horizon rotates counterclockwise in the view. scale/crop: No change. GPano:FirstPhotoDate Date No n/a Date and time for the first image created in the photo sphere. scale/crop: No change. GPano:LastPhotoDate Date No n/a Date and time for the last image created in the photo sphere. scale/crop: No change. GPano:SourcePhotosCount Integer No n/a Number of source images used to create the photo sphere. scale/crop: No change. GPano:CroppedAreaImageWidthPixels Integer Yes n/a Original width in pixels of the image (equal to the actual image’s width for unedited images). See diagrams above. scale/crop: This property needs to be updated to reflect the new size of the image. GPano:CroppedAreaImageHeightPixels Integer Yes n/a Original height in pixels of the image (equal to the actual image’s height for unedited images). See diagrams above. scale/crop: This property needs to be updated to reflect the new size of the image. GPano:FullPanoWidthPixels Integer Yes n/a Original full width from which the image was cropped. If only a partial photo sphere was captured, this specifies the width of what the full photo sphere would have been. See diagrams above. crop: No change. scale: This properly needs to be scaled accordingly. GPano:FullPanoHeightPixels Integer Yes n/a Original full height from which the image was cropped. If only a partial photo sphere was captured, this specifies the height of what the full photo sphere would have been. See diagrams above. crop: No change. GPano:CroppedAreaLeftPixels Integer Yes n/a Column where the left edge of the image was cropped from the full sized photo sphere. See diagrams above. crop: If the left crop of the image is changed, this value must be updated. GPano:CroppedAreaTopPixels Integer Yes n/a Row where the top edge of the image was cropped from the full sized photo sphere. See diagrams above. crop: If the top crop of the image is changed, this value must be updated. Non-programmers can add the metadata example below to their existing full photo spheres (360 degrees x 180 degrees) with only small modifications. This can be done in image editing products, such as Adobe Photoshop. CroppedAreaImageWidthPixels, CroppedAreaImageHeightPixels, FullPanoWidthPixels, FullPanoHeightPixels, CroppedAreaLeftPixels, CroppedAreaRightPixels. The orientation of the photo sphere in the world frame is defined by Euler angles. Euler angles can be defined in many ways. To be correct, a program must strictly follow the Euler angle conventions described here. The position above the earth’s surface defines a fixed "local frame" XYZ, where Z is up and orthogonal to the earth’s surface, X is true east, and Y is true north. The orientation is defined relative to this fixed "local frame", and the Euler angles are rotations around these fixed XYZ axes. Pose orientation is therefore undefined at the poles. This means that a photo sphere with angles (0, 0, 0) will be oriented such that the center pixel faces due north with the equator of the photo sphere parallel with the earth’s surface. and where: Z = Up, X = East, Y = North. as rotations are not commutative. Note that the heading angle is the same as a standard compass heading.